The author, Sheri Rose Shepherd, is sold out for God. In this enlightening resource book, she gives advice, encouragement, and hope for women’s relationships with men from a godly stance through stories from her own life. She also intersperses some very short fictional stories as well to make a point. Each chapter contains Scripture at the beginning and end, a specific topic for that chapter, a prayer regarding the topic, some advice or “coaching” about the topic, and a fictional love letter to the reader from God. The book is very easy to read and the chapters are not too long. Her writing style is easy to understand as well. Sheri shares from her own painful past and choices she has made with the resultant consequences in order to show God’s ability to heal and use pain for profit. She tells how blessed she has been when in times of pain or difficulty she has surrendered to God and trusted Him to direct the outcome. The topics covered are relevant to women today in their interactions with men. 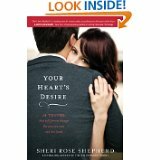 There is something in this book for women who are single, married or divorced. Sheri does a good job of showing women that their place is as a helpmate to their husbands, which doesn’t mean doormat. Husbands are the captains of the ship, but wives are the radar she says. Above all else, God is to always be the center of our lives and to have communication with Him regularly so we can have a deep, abiding relationship with Him. She reminds women that they are creating a legacy by how they live their lives for the next generations, whether good or bad. What kind of legacy will you leave behind?